Why is the Discovery of the Pentaquark a Big Deal? 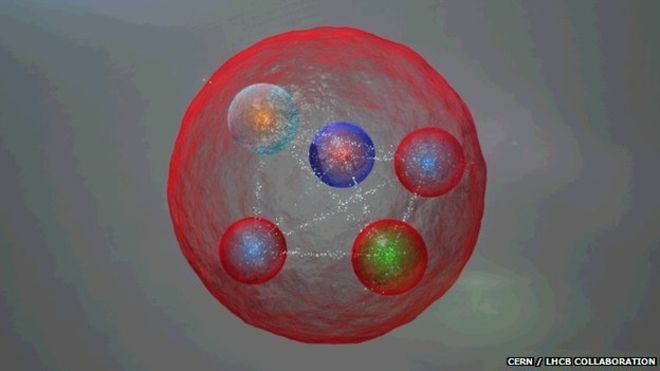 A few days ago, researchers at CERN in Geneva announced that they had discovered the pentaquark. As its name suggests, the new subatomic particle contains five quarks, as opposed to just three like protons and neutrons. This is a huge discovery that’s been years in the making. But although pentaquarks are appearing in the news as if they’re an entirely new idea, that’s not exactly the case. In fact, scientists have known about the pentaquark since the American physicist Murray Gell-Mann predicted its existence over fifty years ago. Plus, the evidence for the pentaquark’s existence comes from data that’s several years old. So what’s the big deal? Well, in particle physics, it’s all up in the air until you get the data – and that’s only the beginning. Once you have the numbers, you have to sort through your massive datasets before you can prove anything. It’s like looking for a needle in a haystack, except you’re blindfolded, and you’re pretty sure the needle is there, but who knows – it might never have existed. Sometimes you find the needle after an extremely focused search, and sometimes – as in the case of the pentaquark – you find it almost by accident. -As you approach the speed of light, time slows down. -Light is sometimes a particle, and sometimes a wave. -Just as there is matter, there is anti-matter, and when matter and anti-matter collide, they destroy one another, and both disappear. Operating under the constraints these rules impose, the physicists at CERN seek to discover new ones like them. More specifically, they design experiments that might reveal more about the smallest units that make up our universe. These experiments are carried out about 100 meters under the ground in a completely airless, highly magnetized, super-cooled circular tube called the Large Hadron Collider (LHC). The LHC has one main job: smashing protons together. A 27-kilometer ring under the ground whirls these positively charged particles in opposite directions. It directs the protons so that they hit one another in spectacular crashes that maybe, just maybe, will reveal something about what they are made of. Primitive though it may sound, smashing particles together to break them open is the most foolproof way to figure out what’s inside them. And the LHC itself is anything but primitive. It’s the single largest machine in the world. The tunnel is surrounded by over 1,600 enormous magnets, each of which weighs over 27 tons. These magnets have to be kept at -271.25°C, which requires almost 100 tons of superfluid helium. The LHC is so powerful that it can accelerate protons so that they travel the 27-kilometer ring 11,000 times per second, which is just 3 meters per second less than the speed of light. The machine can send billions of protons flying into each other at one time. Of course, nobody can see these spectacular particle crashes. They are witnessed only in the enormous amount of data that detectors send from the LHC to computing centers all over the world. The detectors record quadrillions of proton-proton collisions, generating about 25 petabytes of data per year. That’s 25,000 terabytes, which is 25,000,000 gigabytes. If you had only MacBook Air computers like the one I’m writing this article on now, you’d need 195,313 of them just to store all that data. And storing the data is a small challenge compared to reading and interpreting it. From the numbers the physicists must build models and recognize the important patterns. Only after a great deal of manipulation can data be translated into the existence of something like a pentaquark. So despite being based on really old theories and relatively old data, it’s safe to say that the discovery of the pentaquark is a pretty big deal.